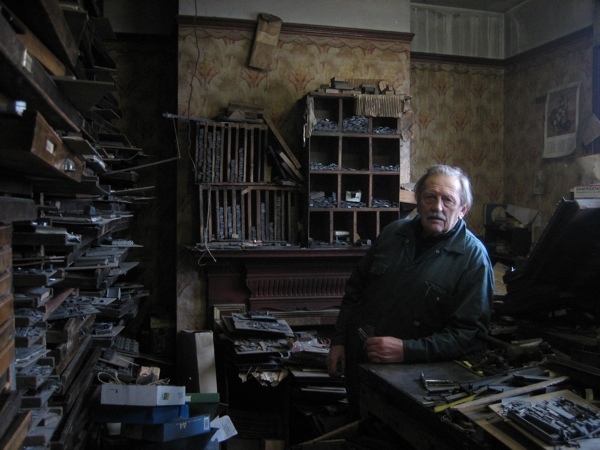 In the week before Christmas, I always want to go and visit my friend Gary Arber, the custodian of W.F.Arber & Co Ltd, the family printing business and former toy shop at 459 Roman Rd started by his grandfather in 1897. 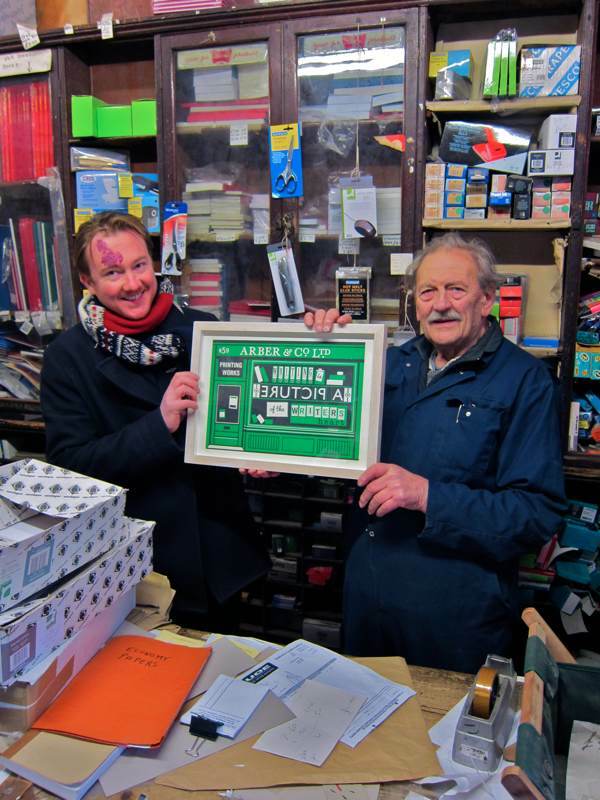 This year, James Brown furnished my excuse for a visit, as I accompanied him when he called round to present Gary Arber with the print of the famous green W.F.Arber shopfront which he has created as a tribute to this celebrated business where once the suffragettes’ handbills were printed in the basement. James rang the bell and Gary emerged to greet us from behind a pile of boxes in his blue boiler suit that is subtly reminiscent of his former career as a flying ace. An experienced third-generation printer, Gary immediately pointed out the quoins on either side of the phrase “A PICTURE” and I think I noticed a barely-concealed sigh of relief from James when Gary gave the work his approval. We were informed that when Gary’s grandfather originally did the sign-writing in 1897, the number 459 flanked the name on both sides of the fascia but when Gary repainted it in 1947 and again last year, he found it sufficient to paint it just once, cocking a snook at the paltry demands of symmetry. In former times, there would be queues outside W.F.Arber & Co Ltd at this time of year as East Enders lined up to collect the toys they had been saving for all year through the Christmas Club. Nowadays, Gary is able to enjoy peace and quiet in December since chain stores took the toy trade away. But he keeps the age-old posters for Triang and Scalextrics upon the counter and century-old wooden display cases for dolls still line the walls today, and he delighted to show us his nineteen fifties Mr Happy wallpaper in the former toy showroom at the back. Sometimes collectors come in to make Gary offers for his residual stock of toys and memorabilia, yet he wisely chooses to keep everything for his personal enjoyment. One year, a thief broke in and stole a box of toys including a handsome train that had been in for repairs. When the box was recovered in an abandoned house nearby, the train was still there – but, by the time the police returned the box to Gary, the train was missing. Imagine Gary’s surprise when the Chief Constable’s son brought the train in for repair the next year and Gary recognised it from the serial number he scratched upon the inside of the case when it was first mended. Characteristically, Gary kept this information to himself until now, choosing instead to savour the knowledge that had been granted to him privately. Do not make the foolish mistake of going to W.F.Arber & Co Ltd Printing Works and asking for printing, because Gary does not take on printing jobs. Instead, he keeps the business ticking over with a few sales of stationery while focussing upon his primary interest – that of maintaining the premises as a receptacle for stories. His big achievement this year has been the repair of the roof, creating another bulwark against the passage of time at his extraordinary shop. 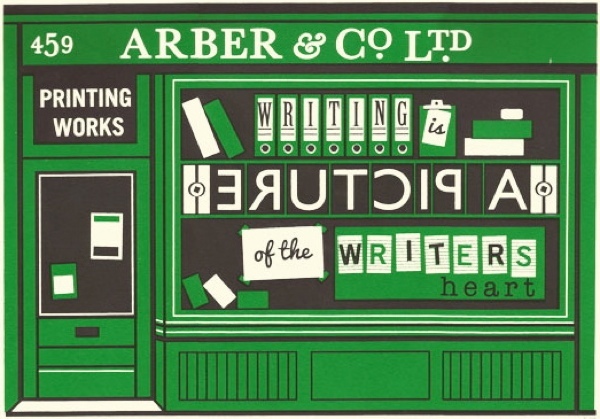 And it was my great delight make the call, deliver the print, present Gary Arber with the compliments of the season and know that all is well at W.F.Arber & Co Ltd.
James Brown’s “Arber & Co Ltd” is one of a series of screenprints of shopfronts currently displayed in his exhibition LOVE & WORK at the Town House, 4 Fournier St, Spitalfields until 23rd December. Great story – am I missing something but didn’t the shop front look better BEFORE the Olympics…? I think I prefer the look of the shop before the Olympics! The window is a treasure trove and magnet to stationery lovers like myself. It just calls for you to go and delve. What a wonderful post. Thanks for showing the beautiful pre-Olympics photograph too. I look forward to a trip to the shop and to James Brown’s exhibition. A magical shop. The sort of place one might try to return to only to find it had last been there half a century ago and you had originally got there through a time-warp portal. It was the earlier articles about W.F. 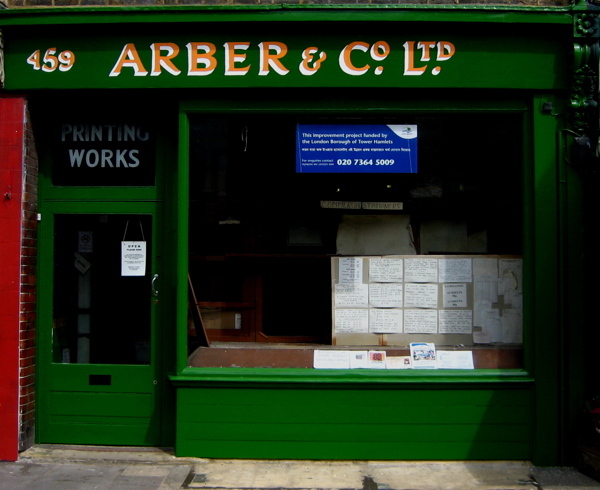 Arber and Co that were part of the reason I first fell in love with Spitalfields Life. And what a marvellous print! What perfect words for something connected to the Gentle Author. I wish there could be copies of this print for sale. A lot of people have commented that they prefer the shop before it was re-painted, but as the last time that I painted it was in the 1960′s the woodwork was beginning to rot. The photo, post painting looks a bit bare but the picture was taken before the new window display was installed, it does not look so bare now. Mary Portas has been filming me as part of an item on Roman Road that she will be showing on Channel 4 in the new year, so anyone who is interested in the old place may get a look inside, it depends on how much survives the edit. 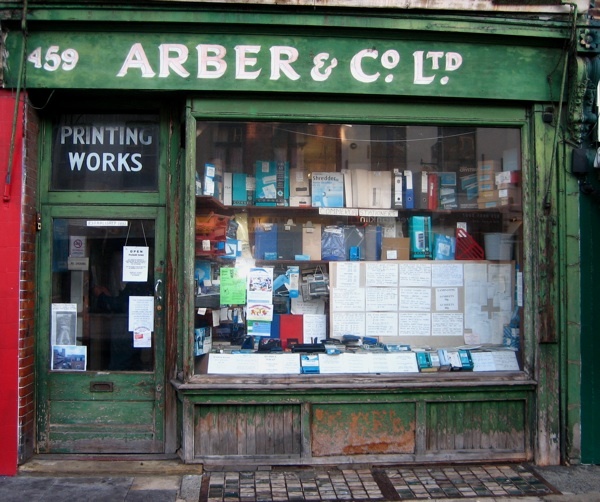 Today I went to Arber & Co. I had a lovely time, and now, when I look at my handsome print, I will be able to think of all that there is behind that facade.